Aberdeen City Hall is located at 125 West Commerce Street, Aberdeen, MS 39730; phone: 662-369-8588. Photo: Adams-French House (Masonic Temple), ca. 1856, Meridian and Marshall Streets, Aberdeen, MS. Listed on the National Register of Historic Places in 1988. Photographed by User:Jerrye & Roy Klotz (own work), 2008, [cc-by-4.0 (creativecommons.org/licenses/by-sa/4.0/deed.en)], via Wikimedia Commons, accessed January, 2016. 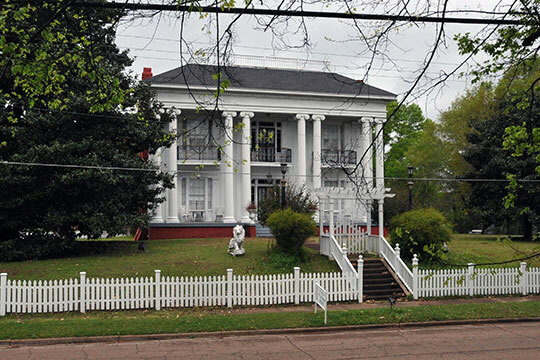 Aberdeen, the seat of Monroe County, is historically significant as a cotton shipping port for the Black Prairie region in the antebellum period and architecturally significant for its surviving examples of mid-to-late nineteenth century buildings and, to a lesser extent, for its early twentieth century residential architecture. The town's extant antebellum buildings symbolize the prosperity, culture and power that belonged to Aberdeen's citizens at this time. A significant period of expansion for the community lasted from ca. 1830 to 1930. This era saw the construction of locally significant examples of the Queen Anne, the Colonial Revival, the Neo-classical, the Bungalow and the various "revival" styles. Additionally, Aberdeen boasts one of the finest Neo-classical city halls in the state. The town's Old Post Office and Courthouse are also significant as one of the few Mississippi expressions of the Richardsonian Romanesque style. The Johnson-Butler House, a bungalow at 210 High Street, and the Tudor Revival C.C. Day House at the northwest corner of S. Meridian and High Streets are also among the best examples of their respective styles in Mississippi. Aberdeen was incorporated in 1837 and by the following year had a population of 2,700. The town's first decade of existence was one of steady growth. The buildings remaining from this early period, which have been identified in this survey, are all houses. Included among these are the Captain Thomas Coopwood House (the earliest section of which reputedly dates back to at least 1836), the Colonel Abner Prewett House (1840), and Scuppernong (1842). All three houses have been extensively remodelled and/or enlarged; however, these changes themselves are, in many cases, significant. The Capt. Thomas Coopwood House, for example, is comprised of an 1836 brick building connected to an 1852 Greek Revival, frame cottage by an enclosed porch. The brick building itself has undergone some minor alterations. The front facade of the Colonel Abner Prewett House has been extensively altered. It is speculated that the house originally had a full-width, two story gallery. This gallery's box columns were probably utilized in the construction of the central, two story portico flanked by one story galleries now gracing the front facade. Scuppernong is a one-and-one-half story, frame, Gothic Revival house. Its front (east) facade received its Gothic Revival treatment sometime after 1870. Susan M. Enzweiler, Architectural Historian, Aberdeen Multiple Resource Area, nomination document, 1987, National Park Service, National Register of Historic Places, Washington, D.C.